There is no question that Sweden has to be considered the number one country in terms of producing great sleaze rock bands in the last ten years from Crazy Lixx to Sister Sin to Confess, and the list goes on an on. However, the south east portion of the United States of America may well be starting a take over from Sweden with some amazing debut records from sleazy rockers Dirty Skirty, 21st Century Goliath, Kickin Valentina and Last Call Messiahs in the last few years. Kickin Valentina are back for round two with their EP Super Atomic. I must say that the band started with a lot of pressure as far as I was concerned. Although I had only heard one song from Kickin Valentina prior to purchasing their entire discography — alright, it only consists of two EPs — I was fully aware of the words from my predecessor Skid who stated in his review of Kickin Valentina‘s self-titled debut record: “After hearing these five songs, expectations will be extremely high for the band’s next collection of tunes.”. In a way, it was quite unfair of me because instead of giving a clean slate to Kickin Valentina, I went in listening to their sophomore CD with lofty expectations that they would likely never be able to meet. Accordingly, I was a bit disappointed when first listening to Super Atomic since I was expecting to find the next Appetite For Destruction. That has admittedly not been the case with Super Atomic but it does not mean that the EP is not dripping with sleazy raunchy attitude filled rockers because it really is! There is not one bad song on Super Atomic. Well, I take that back sort of. I don’t consider the opening track “Sermon” to be an actual song as rather an unnecessary CD opener. For almost the first ten seconds of the track, I can hardly hear anything and then for the rest of the track’s twenty four seconds, I hear these barely inaudible words. Luckily, this appears to be the only mis-step from Kickin Valentina on Super Atomic as all of the actual songs on the release rock from start to finish. Truth be told, all the tracks sound pretty similar to me with the exception of “Fist N Twist” which is the standout song on Super Atomic. “Fist N Twist” has a passion and fury that will surely make it one of the favorites for the band to play live. Part of the reason why the songs sound somewhat the same is that singer Joe Edwards‘ sleazy, gritty and raunchy vocal delivery fits the songs very nicely but he does not provide much, if any, variety in his delivery. For the most part, Kickin Valentina deliver original sounding material but “When You’re Gone” reminds me a lot of L.A. Guns‘ “Electric Gypsy” with some of its guitar parts, which is definitely not a bad thing since the latter is one of my all-time favorite songs. 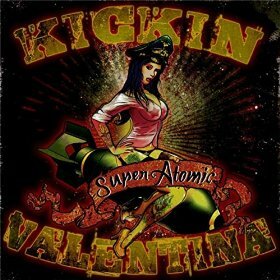 The songs on Kickin Valentina‘s Super Atomic show that there will always be a place for well played sleazy rock and also prove that the south east portion of the U.S.A. is ready and poised to give Sweden a run for its money in terms of where the best sleaze rock bands emanate from these days.